High-end home within walking distance to beaches, restaurants, and shopping. Absolutely gorgeous downtown Coeur d Alene home! This vintage charmer has undergone a full remodel in 2018 and is well thought out from the timbered, covered front porch and stone masonry accents to the shiplap walls and intricate tile work. At every turn, the eye is amazed by the craftsmanship and planning exhibited in this 3 bedroom, 2.5 bathroom home of Bella Vista. 2 separate living areas, quartz countertops walk-in shower in the master bath, large laundry room and ample parking as well. 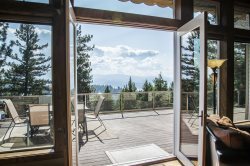 Enjoy this incredible location in the center of everything Coeur d Alene has to offer! Perfect for entertaining, the main living area features an open concept floor plan. The spacious fully stocked kitchen has gorgeous quartz countertops and an open bar area with seating for 3 and stainless steel appliances. Adjacent to the kitchen, the wooden dining table is a wonderful place to enjoy your meals. Comfortable couches and a large television located on both levels of this home makes for an inviting spot to relax. There are also games and cards located on the lower level if you decide to have a quiet night in. On the lower level, you’ll find a bedroom with a bunk bed with a full bed on the lower bunk and a twin on the top bunk. There is also a full bathroom on the lower level. Upstairs, the stunning and spacious master bedroom has a king bed, huge TV, walk-in closet and your own private bathroom. This spa-like area has a luxurious standing tile shower. There is also another bedroom with a queen size bed on the main level as well as a half-bathroom. The front porch’s comfortable seating is the perfect spot to enjoy your coffee as the day begins. When you’re ready to get out and explore, a vehicle isn’t mandatory because Bella Vista is located right in the thick of it all that downtown Coeur d’Alene has to offer! You’ll be only minutes from a wide variety of dining and shopping, beautiful public beaches and parks—and even hiking for a variety of athletic abilities on Tubbs Hill. If you would like to have a vehicle during your stay, you’ll have access to a covered carport, parking behind the home, and ample street parking. An ideal location, ample space and beautiful décor—this home has it all! A very friendly team who have all the answers to any questions. They were really helpful!